Agnosante is one of my absolute favourite Montreal companies. They finally have made healthy eating and meal prep a simple thing… because it is out of the consumers hands in this case. They deliver my meals on Monday and I have all that I need for my lunches for the week. Can it get any better than that? Not so sure.. 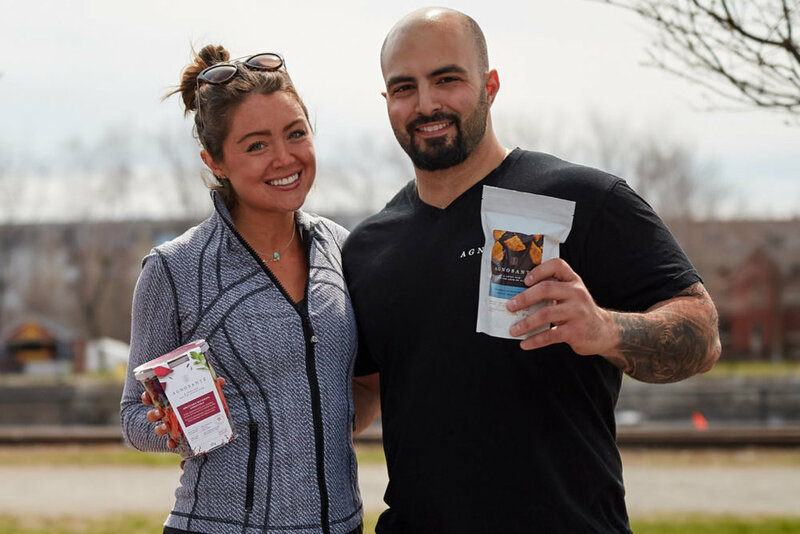 I've had the pleasure of getting to know the man behind the brand, Alex Bakakis, who is an absolute professional and sweetheart making for an incredible partner in work and someone you would totally trust with your nutrition. I decided to interview Alex to get a little bit more on the story of Agnosasnte and how it all started. Here is what he had to say! Agnosante is more than a meal prep service. Of course our goal is to facilitate a healthy lifestyle by preparing gourmet healthy, organic meals for our clients in the greater Montreal area, but it's more than that. Agnosante is about purity, no preservatives, no proprietary blends. Only fresh, wholesome ingredients prepared with lots of love and care. Food is a very personalized choice and when our clients place their orders they trust us to prepare their order to perfection. My best friend and I have known each other for many many years. He would probably describe me as very passionate and dedicated to everything I do. What inspired you to start Agnosante? As a personal trainer and nutrition specialist I consult clients for many different reasons. Sure I have clients that want to loose weight or gain muscle mass, but I have many clients that consult me for various autoimmune disorders such as Crohns, IBS, Colitis, Diabetes and other hormonal disorders. When clients consult me they leave the consultation with lots of motivation to prepare their meals and begin an active lifestyle. Unfortunately they're faced with challenges along the way such as business meetings, travel for work, kids activities. The list is never ending and I Can attest to that as a father of two young girls (Sophia and Billie). I created Agnosante to facilitate a healthy lifestyle without sacrificing taste, variety and most of all consistency. We allow the client to be able to customize their order based on their dietary needs. We are fully gluten and dairy free and we only use organic veggies, meat and poultry, but we understand that some individuals may be allergic or intolerant to certain foods. Which is why we are able to accommodate clients with specific dietary needs. What cultural or life influences inspired Agnosante? I remember telling my wife I wanted to start Agnosante on our very first date almost 4 years ago. Having a busy schedule myself, preparing meals wasn't always easy. I have to admit I would often order in or pick up and I didn't always have the choice of healthy meals, let alone organic. Not many restaurants would accommodate my dietary needs and doing groceries and preparing my own meals often led to me eating the same things over and over again. I knew I wasn't the only person with this dilemma so I decided to take matters into my own hands and launch Agnosante. Where do you enjoy spending time in Montreal? Montreal is a great city with so many things to do and see... and lots of great places to eat, but there's no place like home with my family. My wife and I have two beautiful baby girls, Sophia (2 years old) and Billie (4 months). With a very busy work schedule, anywhere with my wife and kids is where I love to be. The world has lots to offer and many places I would love to see and explore, but my favourite travel destination is Greece. To be more specific the island my family is from, Zante, in the Ionian. Beautiful beaches, great food, lots of great sites to see and most of all it's a great place to unwind. Agnosante has grown tremendously since I launched in 2013. Its really fun and rewarding to see how happy our clients are and to be getting their great feedback. I owe our continued success to our loyal customers and our dedicated staff. My goal is to keep growing Agnosante in the greater Montreal area and ultimately across Canada.... and one day in the United States. I plan to do this maintaining our great quality, great taste and purity. Who are your role models, people that have influenced you? Growing up I never looked up to celebrities, or athletes. They were without a doubt impressive, but my role models were three very special people. My late grandfather (Denis) and my uncles (Nick and Dino). My parents divorced when I was very young and my father was never very present. I was raised in my grandparents home. Spoiled with amazing home cooked meals and endless stories about my grandparents life growing up during World War II and of course the daily lecture of why being Greek is great. I had the privilege of having my grandfather as a father figure and my uncles who are more like older brothers. I remember doing everything with them, from washing the car to going to their office, repairing things around the house, going to hockey games, playing sports, vacations and so much more. They taught me to be caring, hard working and most of all to be respectful and honest. They've had the biggest impact in my career, but most of all they pushed me and motivated me to grow as an individual. I'm lucky to have them. For more information on Agnosante, their meal delivery service, cleanses and staying up to date, please visit this website here.